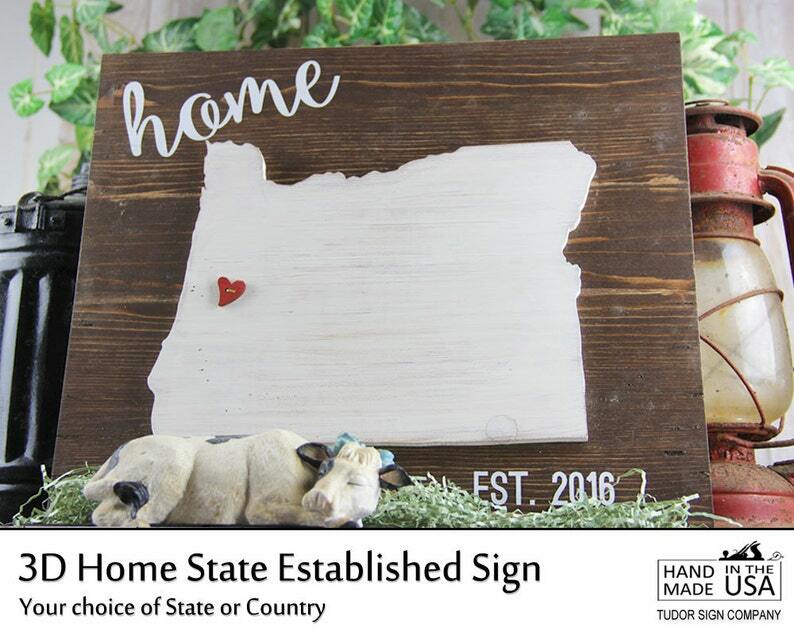 4) Last Name or "home"
Personalized State Sign with Family Last Name & Established Date Rustic Home Decor. This makes a great Realtor Closing Gift as well as a Housewarming Gift that is sure to be an heirloom. ⦿ From the Drop-Down Menu choose the size of your sign. ⦿ Click the "Add to Cart" button and proceed to checkout. • Specify whether you would like your Last Name substituted for the "home"
⦿ Good job! Time for you to relax while I do the work. NOTE: If no CUSTOM Colors are specified, I will make as photographed (Walnut stained Background, White painted Text and State). As always, feel free to message me PRIOR TO ORDERING if you have any special requests (for example: different size or a country). Just click on the "Request a Custom Order" link right below the listing's photo. This reclaimed wood sign is planed and jointed for a smooth finish. The letters are hand painted and the state wood cutout is meticulously hand cut, sanded, and stained. I lightly distress your sign to show off the wood's characteristics. A little red heart pinpoints your whereabouts on the map. Please message me with the town name so I can attach the heart for you. You may also substitute your last name for the "home". For your convenience, I have attached a professional wire hanger on the back of the sign. Please read each item description carefully. The products in the shop are made upon receiving payment for your order. The turnaround time will depend on the current workload I am experiencing. Please see Shop Update section for the current schedule. If you need it sooner, please message me BEFORE ordering to see if I can speed up the process. There may be an additional “Rush Order” fee. I ship most of my products via USPS with 2-3 days priority shipping. I will email you the tracking number so please make sure you have an updated email address linked to your Etsy account. Payment is required before I begin working on your sign. Absolutely love, love, love this! Shipping was fast and this will be my go to anytime I need a house warming gift!